After stressful events this past weekend I was reminded of how much we take for granted. We get into our daily routines, sweat the small stuff (that we perceive as a huge, insurmountable problem), get mad because of stupid things (that of course are the most important things in the world while we are in the moment), but when we put all of our daily discomforts against a real, large issue, that’s when we get perspective. I have to admit, I took for granted the safety of my own home up until it was almost compromised. I complained regularly that living with 8 people in the house was unbearable until it got to the point when I wished I had all 8 of us standing against what threatened us. I use to think that my military father and his “super hero cop” brother were paranoid when they insisted on teaching my me and my brother certain things, until I instinctively found myself searching for a weapon in the darkness of my house while a man at my door was trying to get inside. I am not sure what would have happened if my other half wasn’t thinking on his feet and didn’t call the police when he did. I am not sure what would have happened had we not installed the security system that we did… Frankly, I don’t want to think about it especially in lieu of new evidence that these people have been watching us for a few days. These people knew we were home and they were coming for us. I write here about being strong mentally and physically. I tell you that you can achieve and overcome everything if you put your mind to it. I write about having the steel resolve to rise above. Well, I have to say, some things bring even the strongest to their knees. I am mad today because I am still letting these people and their actions get in my head. I am mad because I flinch every time I hear leaves move in my yard and every time I see headlights around my house. I guess it will take time for me to get over it. The reason why I am telling you all of this is: be grateful for every day that you have and every carefree minute that you get. The stress that you are under today can easily be doubled or tripled tomorrow. Appreciate your friends and your family, tell them daily that you love them, and forgive them their small transgressions and annoying habits. Be kind, be generous, be genuine, and be you, because you never know when that moment can get taken away from you. 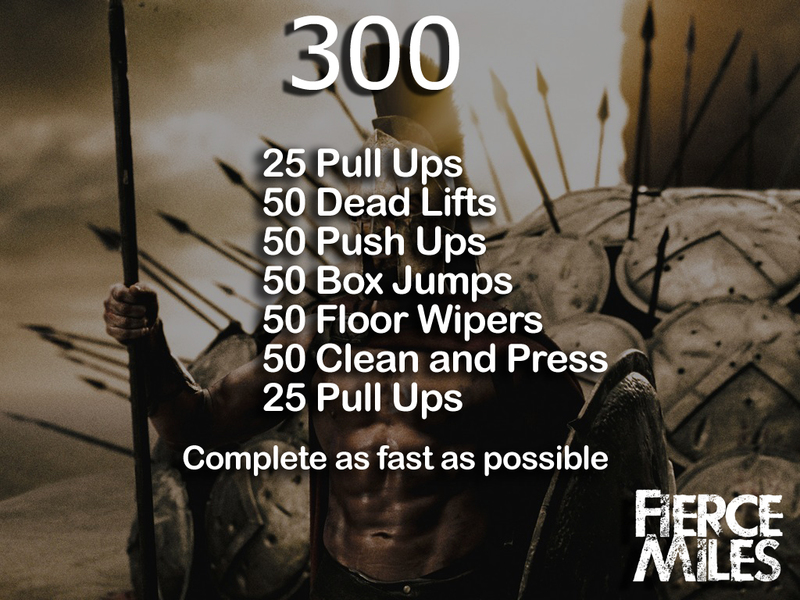 On December 17th of 2013 I decided that I am going to take the Spartan challenge and do the 17 workouts that the actors did to prepare for the movie 300. Below is the assessment workout that I did at the beginning and at the end of the 17 workout period (a little over a month). I have to say, this is not for the weak or those that are just starting their training, but if you have been at it for a while, it is a good way to test your strength and endurance. At the end of the challenge I completed this workout 20 minutes (!!!!) fast then the initial. Can you believe it? I couldn’t! Another worthy point to mention is that before I embarked on this journey of becoming a Spartan, I was deathly afraid of box jumping and bear crawls. I just never thought of myself as the kind of person that was coordinated enough to do these exercises and escape in one piece. Now, I deliberately seek out boxes to jump on and bare crawl whenever the opportunity presents itself. But enough about me! Let’s get back to this workout! Complete the following exercises in as little time as possible. Don’t stop, keep pushing! Log your time and share it below! Last year, when I started Fierce Miles, I had a bright idea: why not write an actual cookbook? The majority of the work was already done, all I had to do was test, photograph, write, edit, format, market, and sell the book! Not a big deal, right? Right. After a few months of writing, re-writing, editing, and writing some more, I am just a few short months away from the big day. I am excited and yet a bit nervous. When I first decided to do this, I had no idea how much work I am going to have to put into this project for it to be what I really want it to become — the absolute go to for every fit food lover. So far, we are right on track. Our Kickstarter page goes live next week, our graphic designer is working on a fabulous book cover that’ll be ready around the same time, and I am almost done organizing the content and the recipes into chapters. I know, this is an unusual Monday post for me, but I’ve had this on my mind for so long, that it was time to share it with you guys. 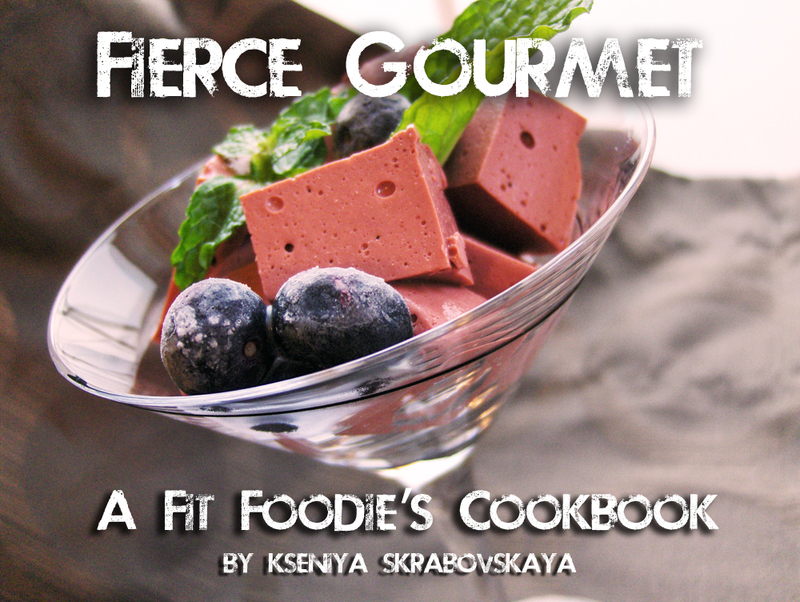 Stay tuned for more information on Fierce Gourmet: A Fit Foodie’s Cookbook. It’s the middle of January and many of you might be starting to think that the New Year’s resolution you made wasn’t an objective one. Maybe you motivation began to wane and you started to skip workouts, slip off your diet, and began making excuses to justify it while feeling guiltier than ever in the process. Does that sound like something that you are going through? Don’t worry, there is a way to fix it. Stop feeling guilty and beating yourself up over your past failures. What’s in the past is in the past and there is nothing that you can do to change it. What you can do, however, is resolve to be dedicated to your goals and promise yourself to practice disciplined behavior day in and day out from this point on. Minor slip-ups will happen and we have to move past them. 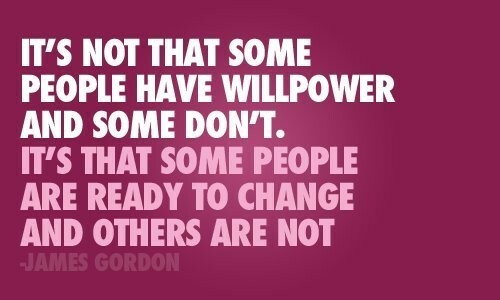 Train your will power just like you train your body. Saying “no” to a piece of cake gets easier after you said “no” 500 times before. Re-evaluate your New Year’s resolution. Why did you make it? Is it realistic? Is it sustainable? Answering these questions will help you set benchmark goals along the way which will help with the process of achieving your greater goal. For example: “I want to lose weight” is too generic of a goal but can be your greater goal. “I want to lose 5 lbs by the end of February because I am running a 5K on February 28th” is a specific goal with a modifier (running a 5K) which can be broken down into two (or even three) separate benchmark goals: 1) benchmark goal being losing 5 lbs by the end of February, 2) run a 5K on February 28th, 3) finish a 5K at a certain time. Benchmark goals are smaller, more achievable goals that help you celebrate your wins and achievements. Setting these goals keeps you more motivated, more concentrated on the task at hand especially if there is a satisfaction of an achievement and a reward at the end. Don’t reward yourself with food. When you achieve your benchmark goals, reward yourself with something other than a trip to the bakery. Agree to treat yourself to a SPA day, a new tech toy, a new outfit, or a night out at the movies. Do something that you enjoy, but do not derail your progress by eating food that isn’t on your plan. After all, you are not a dog, you don’t need treats. It is easier to stick to a resolution when you are part of a community. If you like to run — join a local running group (any specialty running store will be able to give you information about running groups in your area), if you prefer fast paced exercise that tightens and tones – find a crossfit gym, if you don’t like people but still want to get in shape – pay a personal trainer. Even the most seasoned fitness enthusiasts have someone who holds them accountable. One might even say that having an accountability partner accounts to 60% of successfully met goals for most people. If you are still having trouble sticking to your New Year’s resolution after reading the steps above, consider doing a bit more reevaluating and editing. Remember, your goals can evolve out of the initial resolution and the deeper you dig, the more you might be able to find. If you need help “distilling” benchmarks goals out of your greater goal, feel free to contact me via Facebook, Twitter, or just comment below. No one, and I mean no one, wants to hear your conversation with your girlfriend about how awesome the party was last night, how horrible your boss is, or how hot that guy / girl is that you hooked up with last night. 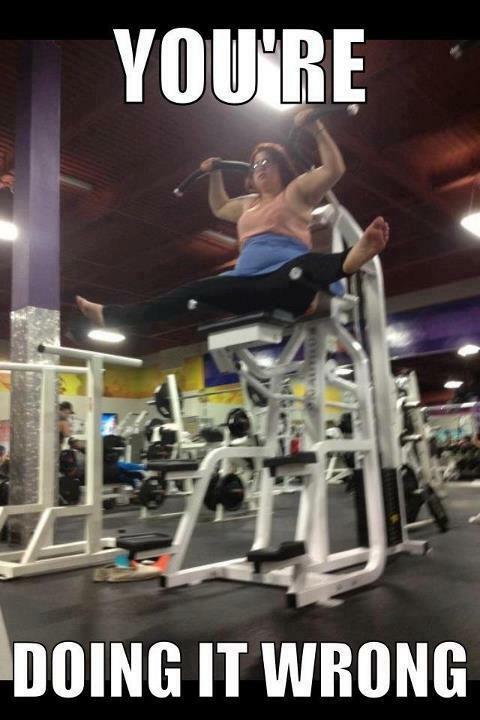 There is a time and a place to use your cellphone and it is definitely NOT while you are working out. Plus, if you can talk on the phone that means that you are not working hard enough, taking up valuable time on the equipment, and annoying everyone who is actually putting in the work. Think of it this way, your gym is like a movie theater but instead of watching a film, you are watching your health and body composition. Don’t be a jerk and disturb everyone around you. Hang up or take it outside! Have a Question? Ask Somebody! This seems self-explanatory, but you’ll be surprised how many people lack common sense. If you have a question about a piece of equipment, ask someone, google it, or simple look at the machine. More often than not there is a demonstration of what it does and how to use it. Don’t just jump in and assume that you can figure it out. Why risk a chance of injury? We know you are working hard and sweating bullets. That’s what you are supposed to do! 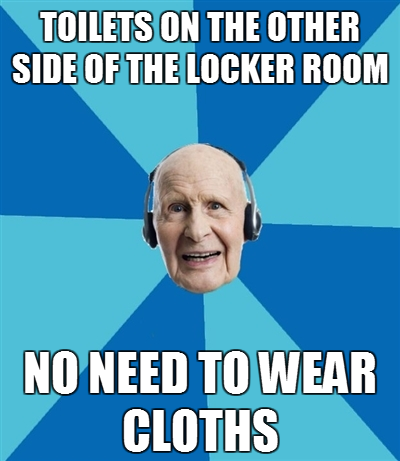 However, be nice and wipe your sweat off the equipment so the other person can come in and use it without having to worry about your funk. 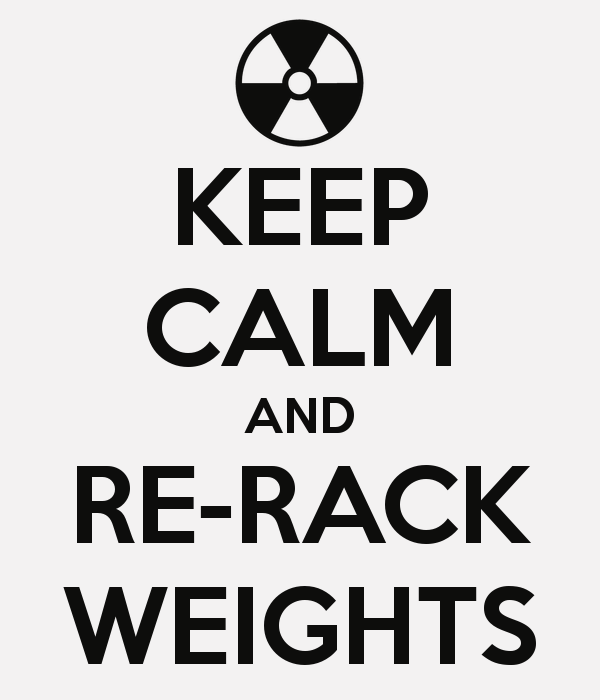 If you can do ten reps, you can do one more to rack your weights. 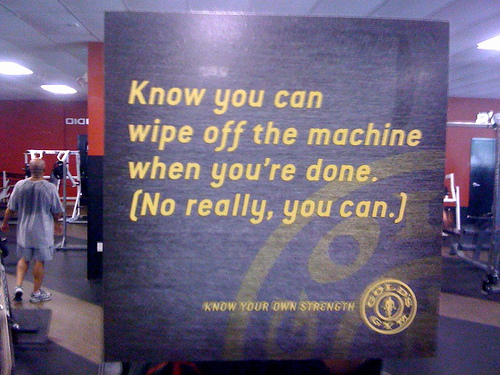 Be considerate to others and to the gym employees who will have to pick up your mess. 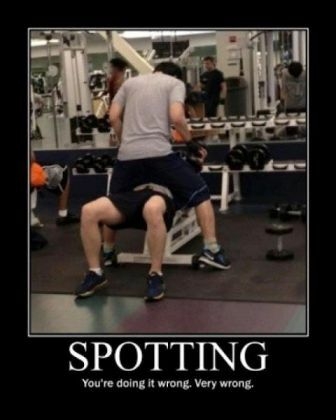 It is NEVER ok to spot another person unless they asked for it. Don’t be that creepy person. Just mind your own business. Waiting to use a machine? Don’t hover. You can always do something else while you wait. You can also politely ask to cut in while the other person is taking a rest. More often than not, they’ll let you. That means be modest, don’t leave your stuff lying around everywhere, and don’t be gross. I really don’t know what could be worse than being hit by a wave of perfume or cologne while you are in the middle of a heavy set. It is disorienting, nauseating, and extremely annoying. Why would you want to wear a fragrance to the gym anyway? Who are you trying to impress? 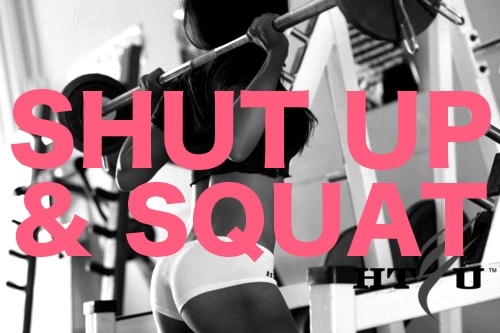 Remember, you are here to workout, not to strut your stuff! 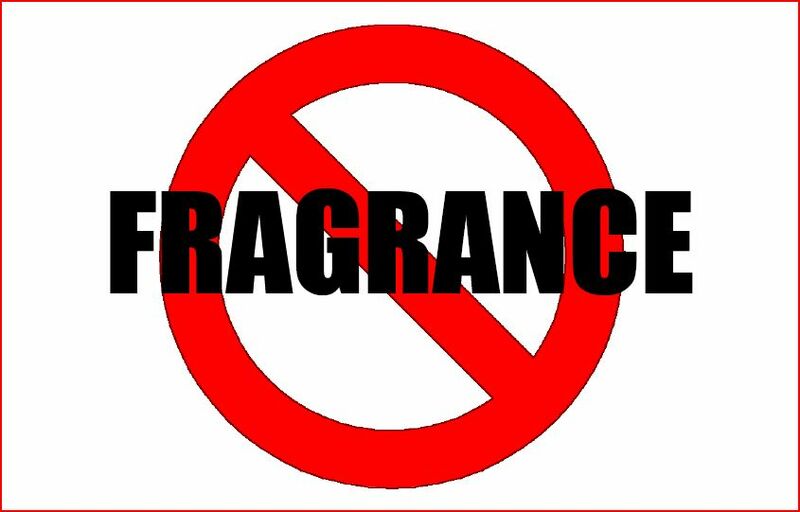 However, perfume and cologne are not the only offensive odors. If you know you have bad BO, take a shower and put on some deodorant, if you are a smoker, please try to refrain from smoking before you come to the gym. Finally, if you think that what you are doing could be annoying or impolite, it probably is. A lot of us made New Year’s resolutions and some of us are determined to keep them come hell or high water. If one of your resolutions was to eat better and make smarter food choices, I’d like to dedicate this post to you. I know all too well how it feels to wake up before dawn and realize that you barely have enough time to take a shower before you have to be out of the door. Breakfast? What breakfast! Then I got to thinking, breakfast is one of the most important meals of the day, it sets the tone for the day. I find that if I had a decent meal in the morning I feel energized, I feel unstoppable, I am on my game. Best of all, having breakfast prevents you from being, what I call, hangry. Hangry is a sad combination of hungry and angry that causes one to make bad decisions and have virtually zero patience. So, what’s the answer to having a healthy, well balanced breakfast that hits all your macros on the go? Portable food! Below is the recipe for the most awesome muffin that is easy to eat, has a low glycemic index, loads of protein, very little fat, and you can make them in advance! What?! Yes, your week just got that much easier! I usually make these on Sunday evening at the end of my food prep because they tend to take a bit longer than the usual blend and go variety. Why? Because I make my Spud Muffins with meringue to insure nice and fluffy consistency. 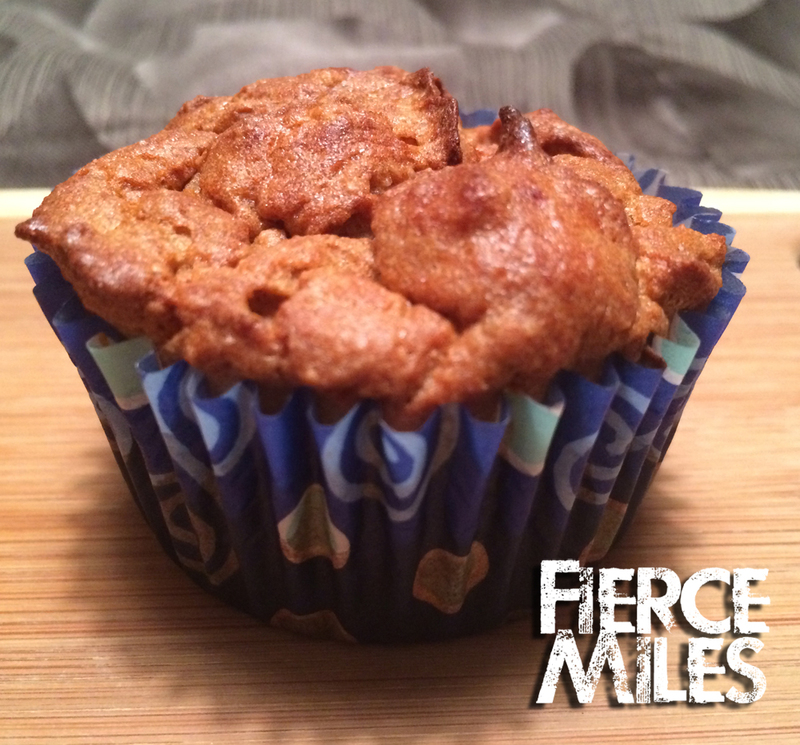 I tested other recipes of healthy, protein muffins and I noticed that all of them are dense, chewy, and taste like cardboard. I refused to have this happen to my food, this is fit gourmet, after all! Let’s dive in! First and foremost, make sure that your eggs are at room temp. Room temperature eggs make better meringue. Also, older eggs are better suited for meringue purposes, but who has old eggs lying around?! I set my eggs out just as I am getting ready to do the rest of my food prep, that way by the time I get around to the muffins, they are nice and ready to go. Peel and cut up your sweet potatoes, put them in a pot of boiling water, boil until tender. Strain the water, mash the potatoes with a potato masher or a fork. I don’t add seasoning to my sweet potato ahead of time, because I refuse to commit to one single flavor in my mash for the rest of the week. I like a good variety. Back to the eggs and the trick of the meringue… You will need to separate egg whites from egg yolks. Make sure that you take great care not to get any of the yolk into your egg whites. I recommend breaking the eggs over a separate dish, separating the whites and then adding them to the mixer bowl one at a time. That way, if you do end up with the yolks in your whites, you won’t have to scrap the whole batch and waste eggs. No, I wouldn’t recommend using egg beaters. 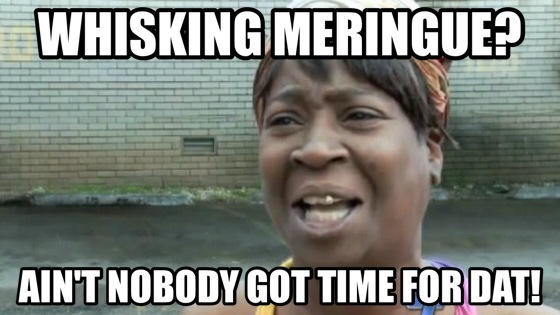 They do not meringue well. Please, do not attempt to be a hero and whisk the meringue by hand. It’ll take you forever! Ok, I think I covered the important basics of the meringue. If you have any questions, feel free to contact me through our Facebook Page, Twitter, or just leave me a comment here! Preheat the oven to 350°. Separate egg yolks from egg whites. Place the egg whites into a large bowl and mix on medium-high speed until the eggs are frothy. When your eggs are frothy add cream of tartar. Continue mixing on medium-high speed until the eggs are white and nearly doubled in size. At this point add Splenda or Stevia one tablespoon at a time. Continue mixing the meringue until the mixture begins to form stiff peaks in the mixing bowl. In a separate bowl, combine all of the dry ingredients. Gradually fold the sweet potatoes into the dry ingredients until well incorporated. Make sure that there are no clumps of flour or protein powder. Gently fold the sweet potato mixture into the meringue. Fold from the sides towards the center until the mixture is well incorporated. Be careful not to over mix and deflate your meringue. Divide the batter between muffin cups. Bake for approximately 35-40 minutes or until a skewer comes out clean.